What happens if you get diabetes mellitus? An elevated blood sugar level (hyperglycaemia) is characteristic of diabetes mellitus. In non-diabetics the body's own hormone insulin ensures that sugar derived from food (glucose) ends up in the cells and is metabolised into the energy necessary for life. This results in a blood sugar level of 80 to 120 mg/dL (4.4 to 6.6 mmol/L), but this can rise to 140 mg/dL (7.7 mmol/L) after eating a meal. In the case of diabetics the blood sugar level remains at an elevated level as a result of a lack of insulin or an ineffective action of the available insulin. Experts also speak of a backlog of sugar in the blood, which is accompanied by insufficient nourishment of cells. The consequence is that the body is not supplied with sufficient energy. Those affected feel tired and hungry. The excess sugar is excreted in the urine (glucosuria). Hence the name diabetes mellitus - 'honey-sweet flow'. Type 1 diabetes usually appears before the age of 35 but older adults can also develop it. Generally Type 1 diabetes begins abruptly with a sudden onset of symptoms and complaints such as increased urine production, abnormal thirst, unexplained weight loss, or tiredness. This form of diabetes originates in a malfunction of the immune system (autoimmune disease). 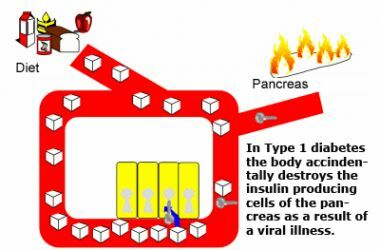 The insulin-producing cells (beta cells) in the pancreas are destroyed by the body's own immune response. 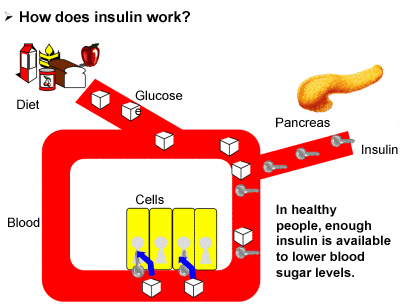 The body is no longer able to produce the insulin that is urgently needed by the cells. With the exception of the first weeks or months after manifestation (remission phase), there is an absolute insulin deficiency. Therapy involves insulin treatment, a vital hormone substitution therapy that must be carried out throughout the patient's lifetime. • Initial diminished sensitivity to insulin, later also defective insulin production. • Treatment: weight loss, increase in physical activity, medication to lower blood sugar, insulin. • Frequently emerges in connection with high blood pressure, fat metabolism disorders and excess weight. Type 2 diabetes generally appears in mid to late adulthood. However, overweight teenagers and young adults are also developing this form of diabetes with increasing frequency. 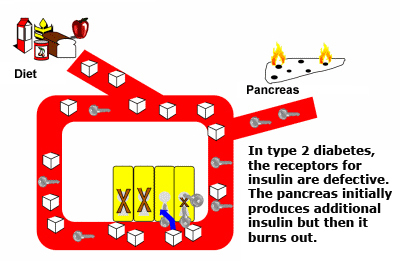 Type 2 diabetes is a combination of a diminished response to insulin (insulin resistance) and faulty insulin production. Blood sugar is therefore transported in insufficient quantity from the blood into cells. Type 2 diabetes rarely leads to serious metabolic lapses but does frequently lead to serious secondary diseases. In addition to genetic factors, excess weight, incorrect diet and lack of physical activity play an important role in the emergence of Type 2 diabetes. The risk of developing Type 2 diabetes increases by a factor of 5 to 10 when these factors are present. For example, excess weight may cause the body's cells to become resistant to insulin. The recommended treatment for those affected is first and foremost a change of diet to lose weight and an increase in physical activity. In the early phase of Type 2 diabetes these measures may be all that is required to achieve a normal blood sugar level. However, if satisfactory blood sugar levels are not achieved, treatment with medication to lower blood sugar (oral antidiabetics) or insulin is required.